Boy, do I have a fun blogger series for you all today: it’s the #gradstudentbloggers and #undergradstudentbloggers round-up! Recently I teamed up with a fabulous, wacky, idiosyncratic (in a good way) group of university-level bloggers who wanted to showcase their student-blogging lives. As a grad student myself, I love meeting other grad student bloggers who can totally empathize with what I’m going through: juggling meetings, going to class, prepping syllabi, writing research papers, and all that other crazy hodge-podge you graduated folks have since left behind! I soon discovered just how difficult it is to find other university food bloggers out there, but with a little bit of poking and snooping, I scrounged up the wonderful, talented group of student bloggers here with us today and asked them all some fun questions. Read on for the interview, and don’t forget to check out all their awesome recipes at the bottom of this post! Know someone who would like to join our group? If you know other university student food bloggers who might be interested, please email me at wallflourgirl@gmail.com. This week’s recipe roundup theme: THE STARVING STUDENT. When you’re waist-deep in debt and every cheap meal comes from a dehydrated packet, it’s nice to know that you can whip up a wholesome meal or snack without hurting your wallet. Find all the recipes at the bottom of this post! Ala: Hi folks! I’m Ala here at Wallflour Girl, and I’m a fourth-year English PhD student who loves children’s literature. When I’m not working on fun research such as Dr. Seuss or Alice in Wonderland, I write and develop recipes for my baking blog. I also love books, swimming/running/biking, and all things digital media. Bec: Hellllo! My name is Bec, and I am the writer of the blog Daisy and the Fox! Nicole: I’m Nicole from PicNic, a New Zealand based food blog creating family-friendly recipes for main meals, desserts, and baking. Shelley: Hi! I’m Shelley, a first year PhD student in political science. I’ve been described as both ditzy and incredibly serious on several different occasions, so I guess I’m a bit all over the place! I love coffee, heaps of junk food, and wasting lots of time. Zainab: Hello! My name is Zainab and I’m a 6th year neuroscience PhD student who needed a break in the evenings from all the failed experiments of the day, so I took to baking. Only problem was I didn’t know how to bake ANYTHING but with the help of Pinterest, food blogs and Wilton courses, I taught myself how to bake and discovered how much I loved it. It is now my favorite way to destress after a long day in the lab. I started my blog to document my baking adventures and it has been the best adventure in itself. I’ve met so many great people and so amazed by the wonderful food blogging community. Ala: Fall into three camps. Camp A is delighted and wholeheartedly supports my efforts as a busy, burgeoning grad student blogger. Camp B is a tad patronizing and comes for the food (though who can blame them? We’re all starving here). Camp C doesn’t know I blog. Camp C is also comprised primarily of my advisors and people who operate on a need-to-know, research-heavy basis. Nicole: Ask how on earth I have time to create all my recipes and look at me like I’m a crazy person! Zainab: Ahem…only my labmates know and I am going to keep it that way! I need those recommendations this year for that post-doc! Ala: Immediately proceed to have a minor meltdown. But only a really minor one, because you still need to stay sane enough to finish that research proposal your advisor wanted by noon tomorrow. Or eat ice cream straight from the tub. Bec: Keep calm and smash your face into a cake. Choc Chip Uru: Nap. Keep Calm and Nap. Nothing will ever be stressful again, I assure you. Shelley: Knead some dough? power through? increase caffeine dose? In the spirit of this week’s fun-tastic theme, The Starving Student, I decided to feature a recipe I actually make all the time for myself as a snack. With an excellent salted caramel taste and none of the expensive ingredients, this no-bake healthy recipe definitely fits the grad student bill! This recipe features my Peanut Butter Larabar recipe: a raw vegan crust with a nut of your choice, nut butter of your choice, and dates–you guessed it–of your choice! The idea is that you can use up anything you happen to have sitting in your pantry, without worrying about buying new expensive ingredients you’ll probably never touch again. I love the salted caramel filling because a) it’s good for you, and b) it’s cheap/easy, with all the caramel taste! This layer showcases blended dates, milk of your choice, and some coarse sea salt, which I get from the dollar store (my BFFL and saving grace for the past seven years). Finally, you get a nice whopping layer of chocolate kick–melt up some chocolate chips and you’re in business! No fuss, no pain, and certainly enough penny-pinching that you can feel less guilty next time you decide to eat at a restaurant with your friends like the normal human being that you aren’t are. Enjoy, and don’t forget to check out my awesome fellow student bloggers below! In a food processor, grind all ingredients until the dates break down into a paste and everything forms a cohesive ball of dough, about 3-4 minutes. Scrape down the sides in between as necessary and press evenly into the bottom of a 9x5-inch pan. In the same food processor (no need to clean), blend the dates until they form a thick paste. Add milk one tablespoon at a time, as needed, blending in between, until the mixture reaches a thick caramel consistency. Add sea salt and blend in for another 10 seconds. Pour caramel over the nut base. Place chocolate in a microwave-safe bowl and heat at 30-second intervals, stirring in between, until chocolate is completely melted. Pour over caramel. Refrigerate bars for at least 4-6 hours before cutting into squares. Keep refrigerated. Want to join, or know a university food blogger who would? We would love to have you: email Ala at wallflourgirl@gmail.com to sign up! The #gradstudentblogger and #undergradstudentblogger series showcases the lives and talent of insanely busy food bloggers from across all stages of their higher education pathway. Thank you for joining us, and we hope to see you again in two weeks! Ala, love this starving student round-up from grad and undergrad students!! 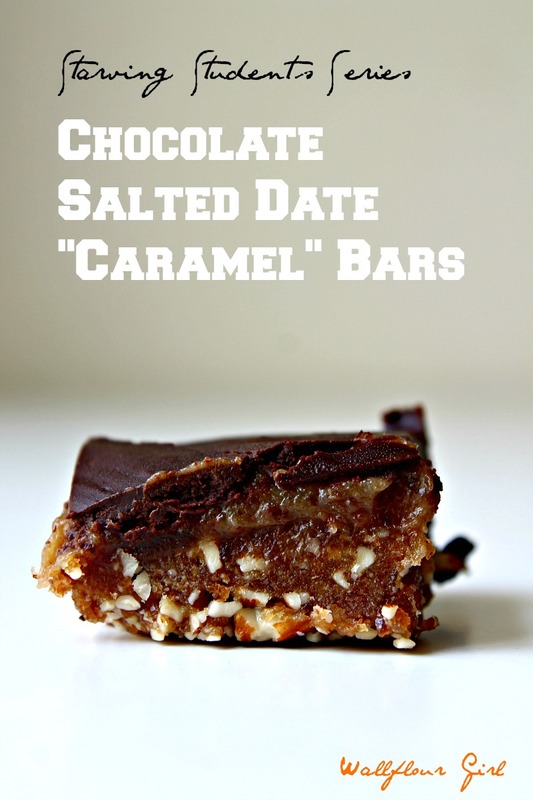 Dude, these chocolate-sea-salt-date-caramel-bars are amazing! THANK you, Alice! <3 I'm so excited for this myself. And these bars are totally lurveeee--you'd love them so much, and I'm sure your family would as well. Cheerios, lovely lady! Ala, this is an awesome series! I freaking love it! And I know most of these bloggers and I love ‘n admire all of you! 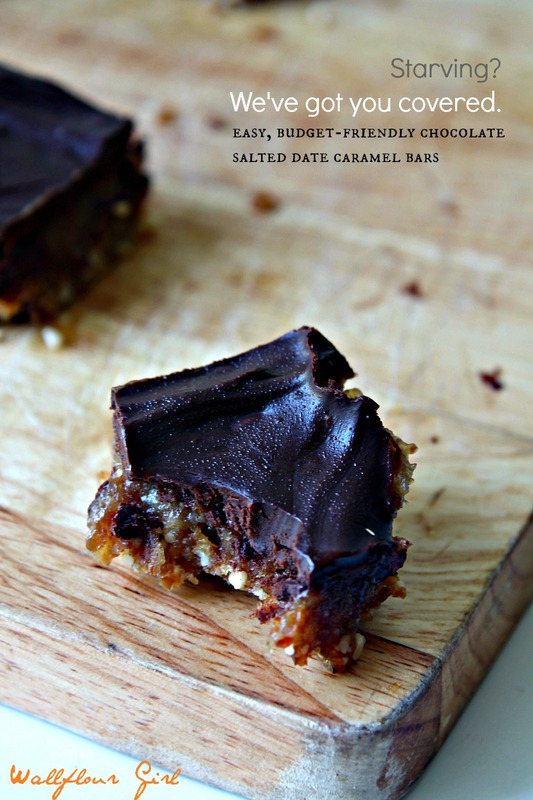 I also adore these chocolate sea salt date caramel bars. I’ve got all of the ingredients at home so let’s see if I can get my shizz together and make them later today. I’m so glad you’re forging ahead with this series. I can’t gush enough over it. Thank you soooo much for your support, Nance! I knew you’d love this one 😀 if only you could be part of this little group and all that jazz! Did you get a chance to try them yet? If not, I know you’re going to love them 110%–plus they’re pretty awesomely healthy, which is an added bonus. I can’t wait to get your input on our next installments!! Missing you, dear, and need to catch up on your wonderful life soon! Fun series! Looking forward to more of the student life. 😉 And this recipe? Amazing — really, really good. Thanks. Thanks, John–I had a feeling you’d like it! I think you’d love this recipe in your kitchen. Cheers! Oh my gosh!! Love this series!! Thank you so much girl for getting us all together 🙂 Now, please pass me some of these caramel bars! I am will be cured from my tiredness all week long with these! Oh, I would gladly pass these along! Next step: sending rotational care packages around the world to fellow student bloggers. (Well, maybe when we’re rich, at least!) I hope you’re not too too tired from your busy life, but good luck and it’s so great having you on board! Your bars… I would actually never go hungry again they look beyond delicious! Caramel + sea salt + chocolate = NOM! These look amazing 🙂 Thanks for setting up the series!!! YAY and it’s awesome having you here. You’d love these bars so much–perfect for our crazyyyyyy lives! Cheers, Shelley! What an awesome series, Ala! Loved reading more about all of you and seeing all these gorgeous recipes! 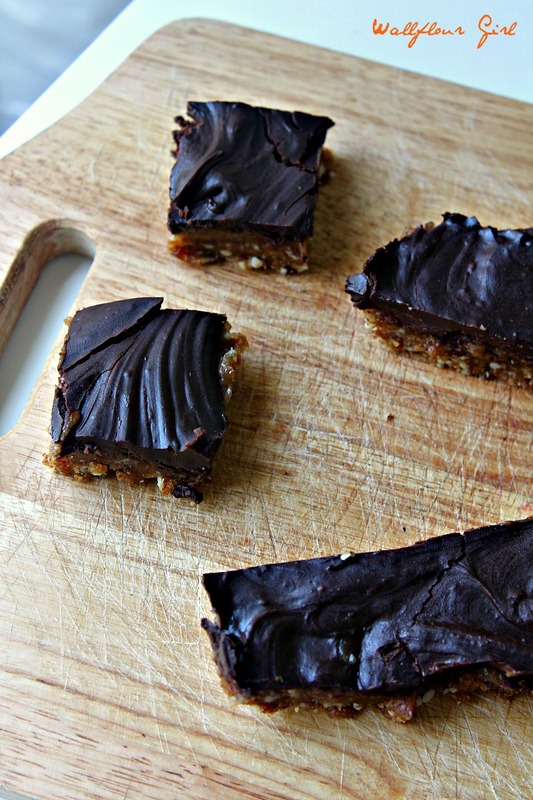 Your caramel date bars look amazing! I love that they are GF, Vegan and raw and with such affordable ingredients, I would totally want to make a batch every single day 🙂 They look phenomenal girl! Aww, thanks so much for the kind words, Kelly! You can totally join the club, because I make these so often it’s not even funny. You’d love it so much. Let me know if you do get to try it–cheers, dear! I’m all for a guilt free chocolate caramel bar that is cheap to make! All day, errey day. Aww, you’re too sweet, Bec! It’s wonderful to have you here with us, you add such a great spark to the group. I’m glad you love these bars as much as I do–totally a student’s paradise! Have an awesome week, lovely lady! These look deeeelicious! Definitely making them to snack on! Eeee yes, do, Meriem! You’re going to LOVE them! I hope you have a wonderful rest of the week! I am SO glad you got your group of student bloggers together! And I loved reading their interview answers (what a fun, talented bunch). 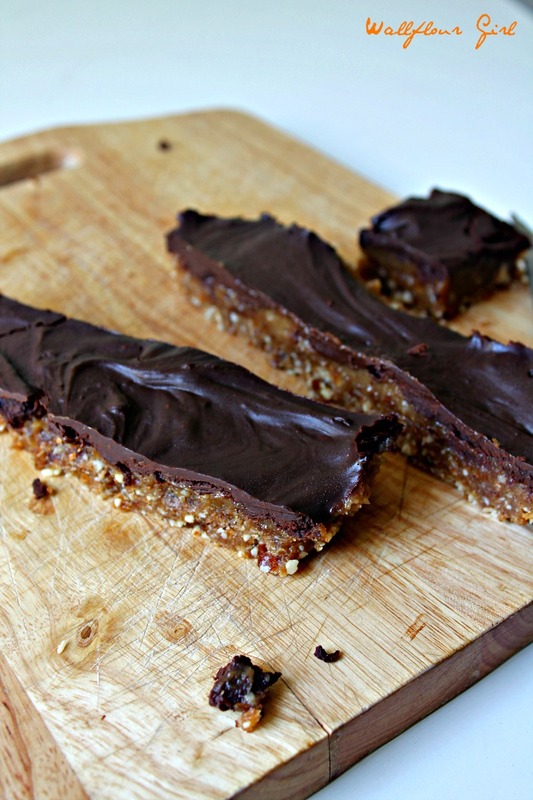 Then there are your caramel bars…swooning here! Yes–and thank YOU for all the awesome introductions! We were all super delighted to find each other 🙂 you’re a miracle worker as always, Liz, and I’m sending tons of hugs your way now. Have an awesome week, dear!! I love everything about this. I’m so, SO impressed how you talented ladies go to school (something that I can’t even imagine doing) and maintain a blog – all freaking great blogs at that. Are any of you even sleeping?! You know…I don’t think we are! But running on as little sleep as I am these days, I’m not sure I’m qualified to make an accurate statement. Who knows =) we are a crazy zany bunch, and it’s great to have you reading nonetheless! Cheerios, gal!